For most of the population Murph’s 200 push ups are the limiting factor. Many athletes will bite off more than they can chew attempting to break them up in to sets of 20. By the time they’ve accumulated the first 100 push ups they are struggling to string three together at a time. 10 push ups (If you are new to Murph, be smart and shake out your arms after five reps, from the very begining). 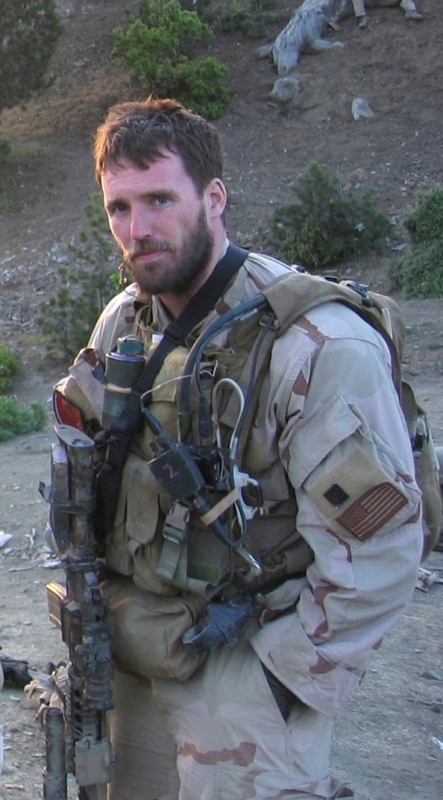 If you’re interested in learning more about “Murph” the man you can check out Wikipedia: Michael P. Murphy. The original post for Murph on CrossFit.com can be found here: CrossFit: Thursday 050818. I have a method that seemed to have some success in my gym. 10 rounds x 10 reps each; push-ups, squats, pull-ups, squats, push-ups, squats. Never use the same muscle group for more than 10 reps in a row and it creates a very balanced rhythm. Good stuff Andrew. Thanks for the suggestion! I thought the idea of the exercise was to do all the pull-ups then move to the push-ups and so on ! At least this is what I understood from the original post. @Phil; I think that TAREK is right. That “partitioned as needed” is that you go for pull-ups for example 20-15-15-10-10-10-5-5-5-5. Push-ups: 15-15-15-15-15-15-10 etc etc. At least this is what I think otherwise it’s A LOT more EASIER. how often would one do this workout? once a week, twice a week? every day?? Bill- it’s a pretty strenuous workout with a lot of reps. I’d say once or twice a year as a test of your fitness would be plenty. Memorial Day and Veterans’ Day perhaps? To get ready for the last race in the series, the Spartan Beast, I vowed to do Murph once a week, for 10 straight weeks. My race is this Sunday and last Sunday I did Murph in 32:11 (no vest) and did the 5-10-15 way. I am 48 years old by the way. I used to do 10 pull-ups, 50 squats and 25 push ups and was wasting my time. I would do it that way in 38:43. As soon as I changed it to 5-10-15, I cut my time down to 32 minutes. The 5-10-15 way works best for me I’d say. After 10 weeks, I don’t find Murph that imposing like I used to. But knowing you can do a hard workout in 32 minutes is a great feeling. Wow! Once a week!?! Makes sense based on your goals but geez! Great feedback on the strategy for splitting up the workout. Thanks for sharing! Are the pull ups traditional or kipping and can you work chin ups in with pull ups? I’m 99% sure the pull ups need to be strict or kipping pull-ups. They can easily be modified with a band, although getting in and out of that will effect your time. Thanks Marcus and Chris! Good question and suggestions! 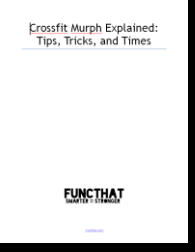 Typically, in CrossFit Land kipping is allowed unless it is specifically excluded (e.g. “strict pullups”).Also, there usually is no distinction between pull-ups and chin-ups. The standard is typically to go from a hanging position with the arms completely extended to the chin breaking the horizontal plane of the bar (check the masters standard for pullups from the 2011 CrossFit Games Event 6). Many people will change up their grip across sets as a way to try to give some muscle groups a bit of a rest. I went 5 pull-ups x 10 push-ups x 20 squats. Finishing the squats early saved my legs a little and let me gain some momentum with the upper body. Finished under 34 for my first ever murph, so I’m thinking it was a good rhythm. Nice job Castro! I’m liking the idea of getting the squats done a little early. So what did Murph do? Each exercise all at once or did he break it up ? Good question Scott. I dug through all the comments on the original crossfit.com post and couldn’t find an answer. If anyone knows please drop a comment or shoot me a note and I’ll update the post with the info. Being he was a stud SEAL and Naval Officer you can assume he did it in the most difficult manner imagineable. LT Murphy performed this workout weekly prior to deployment(s). The fact that cross fit co-opted the workout is meaningless. You can partition but you must follow THAT sequence of exercise. In between the “thens” you complete the pullpushsquat. If you do all 100, 200, 300 in order it is harder and I can respect that. @Gabriel : I agree with you. I start CrossFit 6 month ago with my gym partner (we go in a standard gym club, there’s no CrossFit box in our area). I respectfully disagree with equating a momentum, rhythm kipping pull with a “strict pull”. Difficulty level and eccentric stress load for 100 strict pulls is off the charts compared to the kipping version…and especially with the vest on. Should be a separate RX sub category otherwise it’s apples to oranges comparison. Are the push ups supposed to be hand release or not? Hi Ange- The original workout does not use hand release push-ups. Good luck! That’s great Mary Ann! Strong work! Did Murph today for the first time. Push-ups were indeed the limiting factor (and are a particular weak area of mine), but I got through it without scaling! The 5-5-5-15 scheme saved me. Good to hear Nick! Splitting the pushups into two sets of five is a real game changer for most athletes. Females at my box are wondering what to shoot for eventually. All we’ve ever seen of true RX Murph is to wear a 20lb vest, but is that for males and females alike? If it is, we’ll aim to get there one day (yikes!). CF WODs generally have separate RX weights for males and females though…and we’ve never been able to find anything that says what RX Murph is for females. Thanks for your tips and insight! That’s a great question Erin! The general consensus is that since the workout was originally done wearing military body armor, which weighs the same ~20 pounds for men and women, both men and women would wear the 20lb weight vest during the workout. I’ll update the FAQ with your question. Additionally, I did a little research based on the 87 women who posted Rx’d Murph times at themurphchallenge.com/. Next question: When should I consider using a weight vest? I’d suggest once you can perform Murph in under 40 minutes it’s time to consider adding the vest. Love it; thanks! (And thanks for the quick response!) I’ll let the ladies know. Um yeah… You don’t get a discount for being female. Wear 20 lbs. of body armor or admit you scaled it. I loved your response above re: female rx “Murph,” and I’m wondering about your thoughts on Dave Castro programming 14lb vests for the ladies during the Games? While I wouldn’t dare suggest that the women’s times and efforts are anything but incredible, I can’t help but think that scaling the weight for the women is disrespectful to the essence of the workout (body armor weighs 20lbs whether you’re male or female). From my perspective, the 20lb vest for women would have been in the spirit of this hero workout. And now that a 14lb vest has been used in the Games I’m sure that will become the defacto standard. That being said, most of the gyms I’ve done Murph at only offered 20 pound vests, so perhaps the 14lb vest will make the workout more approachable for lighter athletes? It’s probably worth mentioning that seeing the toll Murph took on the Games athletes, the women in particular, it’s probably a good thing the vests weren’t heavier. I think the issue was the mandatory rep scheme and heat more than the weight, but the heavier vests would have only made matters worse. Erin – you couldn’t be more correct. Women are absolutely capable of doing it with 20lbs. There is only one standard. Do it or admit you scaled it. Either is fine but just be honest. Hello! First, thanks for the suggestions. However, a friend told me that you couldn’t partition the exercises: he meant that you had to complete the 100 pull-ups then do the 200 push-ups and then move on to squats. He told me that it was the way to do a real murph because it’s harder etc. So, is he wrong, or the partitioning suggestions are just for beginners who want to prepare for the “real” Murph? Thanks. Great question. The general consensus is that partitioning the pull-ups, push-ups, and squats is the way this workout is prescribed in the vast majority of gyms. Doing the exercises in order with a weight vest is absolutely harder, and is how the workout was prescribed in the 2015 CrossFit Games. I’ve been unable to track down any information on whether the workout’s namesake Lt. Michael “Murph” Murphy partitioned the workout or performed it straight through. Hi all i need to knoe how can i enter the cross fit event ? I train by my self and do all hard work training i am rady to go . All i need to find upcoming event even the small tournament i love to partecipade . This was don unther 22 minuts . In caspion sea cross fit event just a local chalenge . Strong work Dion! The push ups are definitely the killer. RX vs Scaled, that is the question. So the general consensus, if not the rule, is that if you don’t use a 20lb vest (at least for the guys) it’s a scaled WOD. Correct? And you can still RX if you partition the sets, correct? As someone who struggles to string 5 pullups. In later rounds I would do squats in between every 2 pull ups. I felt breaking it up this way i never felt burnt out from any of the movements. Am I cheating if I do 25 sets of 4-8-12? It seems like I can go much faster the fewer pull-ups I do per set. Did Murphy for the first time last yr. did the 10-20-30 break up for 10 sets. No vest did it in 23:29 at a friends CrossFit gym.